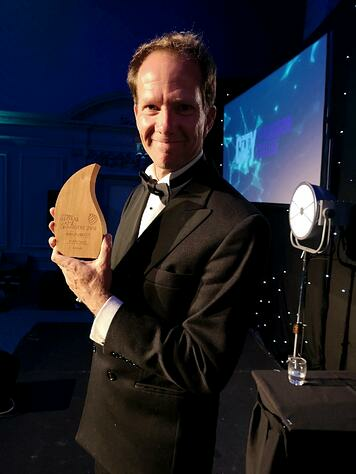 LeanPath was presented with the Food for Thought award at the Global Game Changers Awards hosted in Glasgow, Scotland. The Global Game Changers awards are one of the world’s first cross-sector award platforms recognizing innovations, practices and initiatives advancing the UN Sustainable Development Goals (SDGs). The Food For Thought award is given to a pioneering product, concept or service – created within any sector – for the purpose of contributing to a world without hunger. Steve Finn, LeanPath's Vice President of Food Waste Prevention, had this to say about the event: "The Global Game Changers venue is a brilliant platform for convening leading innovators engaged in the critical work of advancing the Sustainable Development Goals. At LeanPath, we are driven by the fact that food waste prevention has far-reaching impact on multiple SDGs, and we are thrilled to have our work acknowledged with so many standout disruptors for good." It was an honor to receive this recognition amidst the powerhouse nomination pool, including ANJA – ALOHAS ECO-Center, Desolenator, KRIKET, and The Good Food Institute. Check out more of LeanPath's award-winning innovation over at LeanPath In The News.